Say Thank You, I Love You, or Thinking of You with this eye-catching arrangement. 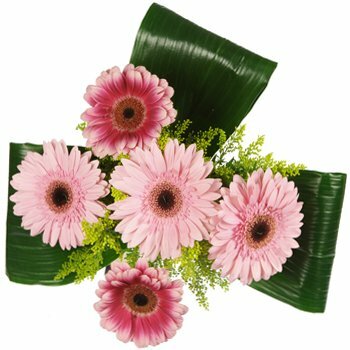 Five dazzling, powder pink Gerberas accented with yellow foliage are perched atop a bed of bright tropical leaves. For Mother's Day, birthdays, or anytime you want to send a heartfelt message, order the Darling Daisies Bouquet.